Gold prices hit $1,350 per ounce for the 13th time in the last five years in yesterday’s trading, after hovering around the psychological level of $1,300 over the last week.The prime catalyst behind the rally was the military attacks in Syria, spearheaded by the United States and its allies. Furthermore, war-related geopolitical risks are lifting up crude oil prices, in turn boosting gold’s value in the market. Gold bullion ETF SPDR Gold Shares (GLD) has gained about 2.4% in the last month. With escalating war tensions, investors are increasingly leaning toward safe haven assets like gold. At this juncture, allocating your hard-earned money in selective gold mining stocks can prove to be a masterstroke. Gold rose above last week’s closing level of $1,347.90 an ounce in Monday’s trading as threats of “actual wars” pushed the price of the yellow metal. Prices had earlier touched a five-week high in March 2018 as threats of a trade war between the United States and China weighed on the dollar and equities. On Jan 25, spot gold touched a high of $1,366 an ounce. Gold value has increased more than 2% in 2018 so far, after recording a healthy 12% gain last year. As markets remain skeptical in the face of the ongoing geopolitical tensions, prices are expected to move northward. The United States, France and Britain launched a combined military against Syria in response to the Bashar al-Assad government’s alleged usage of chemical weapons over innocent lives in the country. The early-morning strikes on Apr 14, comprising 105 missiles, hit three Syrian chemical weapon facilities: a scientific research hub near Damascus and two military centers located west of Homs. The Trump administration has further cautioned that any fresh use of poison gas by the Assad regimen will trigger new attacks against the country. Fresh military strikes on Syria and other Middle Eastern tensions are expected to fuel a rally in gold price, although prices have slightly steadied after the Western coalition attacked Syria last week. Nevertheless, any subsequent retaliation by Syria or its allies, Russia and Iran could lead to further price volatility. Assad’s military base has been severely depleted after seven years of civil conflict and the regime heavily depends on Russian and Iranian military assistance. Repeated usage of chemical weapons by Syria since the beginning of 2017 indicates that Assad will go to great lengths to remain powerful. The alarming geopolitical status quo is fueling an increase in crude prices. Therefore, we anticipate that prized metals like gold will remain traditional safe harbors going forward. The West Texas Intermediate crude futures edged up 0.4% to end at $67.07 per barrel last week – the highest since December 2014. The surge in benchmark crude stems from escalating tensions in the Middle East and fears of supplies being interrupted. The commodity literally took off last week after Saudi Arabia claimed to have intercepted missiles fired by the Yemeni rebels and the American President hinted at the possibility of a military strike against Syria. Crude is also riding on other catalysts like strong global demand and continued production curbs from the Organization of the Petroleum Exporting Countries and its allies. Uncertainties in the markets prompted by the recent developments would likely curb investors’ appetite for riskier assets and fuel demand for safe-haven assets like gold. Over the last month, the Zacks Gold Mining industry has advanced 7% against the S&P 500’s decline of 2.2%. Additionally, the industry has a trailing 12-month EV/EBITDA multiple of 7.1, lower than the S&P 500 EV/EBITDA multiple of 11.3. The industry’s lower-than-market positioning indicates room for some upside moving ahead. In order to cash in on the solid growth potential of the industry, we have handpicked three gold stocks that will likely add sparkle to your portfolio. Besides a favorable Zacks Rank #1 (Strong Buy) or 2 (Buy), these companies have a positive sales forecast for 2018 and 2019. 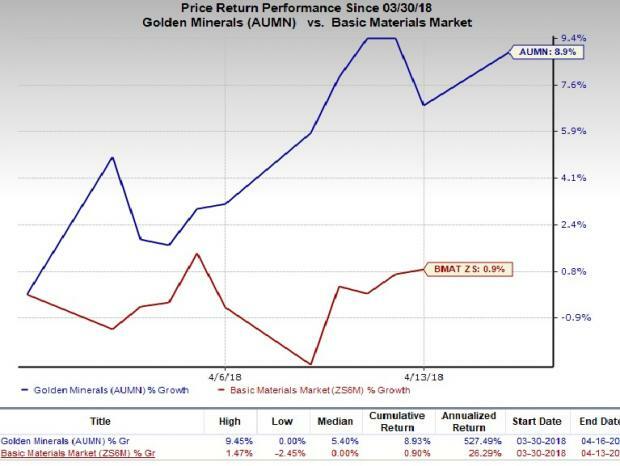 Notably, on a month-to-date basis, these picks have performed better than the broader Zacks Basic Materials sector (including the mining industries). Since the beginning of April, the sector’s growth has outperformed the 0.6% gain recorded by the benchmark index. Let’s dig a little deeper into these three choices to get a fair idea of their individual strength. 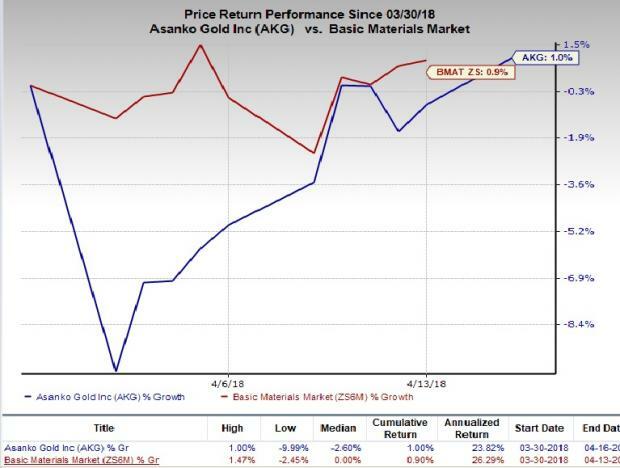 Asanko Gold Inc (NYSEAMERICAN:AKG) engages in the development, exploration, and production of gold properties. The company’s projected sales growth rate is 10.4% for 2018 and 15.1% for 2019. On a month-to-date basis, the stock has returned 1%, slightly outperforming 0.9% gain recorded by the sector. Asanko currently sports a Zacks Rank #1. 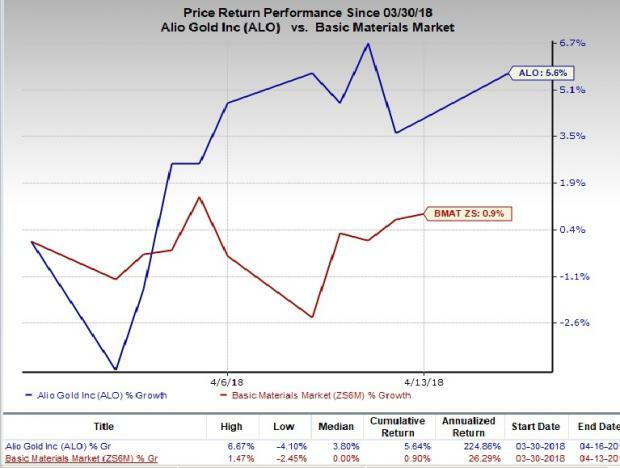 Alio Gold Inc (NYSEAMERICAN:ALO) engages in the exploration, acquisition, development and operation of mineral resource properties (primarily gold and silver). The stock currently holds a Zacks Rank #2. Timmons Gold’s projected sales growth is 69.4% for 2018 and 39.9% for 2019. On a month-to-date basis, the stock has rallied 5.6%, outperforming the sector. Golden Minerals Co (NYSEAMERICAN:AUMN) engages in construction, mining and exploration of mineral properties. The company explores silver, gold, zinc, lead and other minerals. The stock currently holds a Zacks Rank #2. The company’s projected sales growth is 0.13% for 2018 and 209% for 2019. On a month-to-date basis, the stock has rallied 8.9%, outpacing the sector’s gain. The total market cap of all cryptos recently surpassed $700 billion – more than a 3,800% increase in the previous 12 months. They’re now bigger than Morgan Stanley, Goldman Sachs and even Visa! The new asset class may expand even more rapidly in 2018 as new investors continue pouring in and Wall Street becomes increasingly involved. Zacks’ has just named 4 companies that enable investors to take advantage of the explosive growth of cryptocurrencies via the stock market. 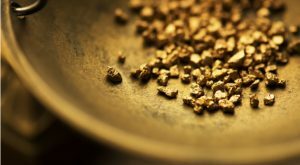 Article printed from InvestorPlace Media, https://investorplace.com/2018/04/3-top-gold-stocks-safe-haven-syria-attacks-ggsyn/.